Draco Twin Dagger Knife Set | BUDK.com - Knives & Swords At The Lowest Prices! This is an outstanding dagger set for the fantasy collector or even someone who wants to accent their work desk with an eye-catching set of letter openers! 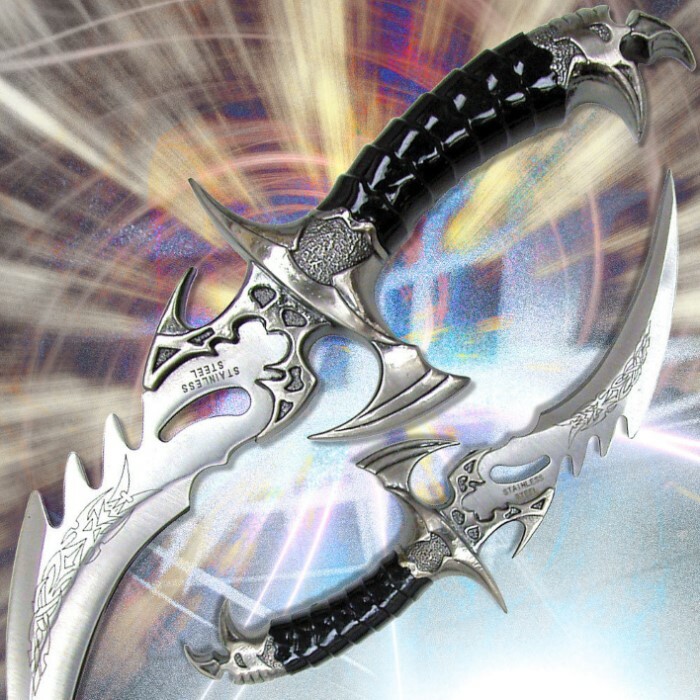 Both daggers feature stainless blades with fantasy etchings. Just ordered and think is amazing so far. Nice knife. Looks really "bad". Sharpens up nicely with a ceramic sharpener. Nice knife for my collection. The small knife is pretty small, and the bigger one is a nice size but I definitely thought it would be more of a full knife size, but the keyword here is "Dagger" so ultimately it is supposed to be pretty small. I'm using it for a videoshoot so the larger one will come across well on camera, the smaller one will just be a backup on the holster. Pretty sharp and pretty cool design though. I ordered this item and it is very impressive, love the look to these 2 knifes. Very nice quality looking forward to buying another set, Thanks BUDK. much smaller than i expected. i would take out a ruler ad actually feel/see how large they would be. overall cool product sharp out of the box and im very happy with them. These knives came in the mail several days ago. I was very impressed except the smaller one of the two is tiny and barely fits in my hands. The only thing that annoyed me was that they are not very sharp.Other than that, GREAT KNIVES! I would recommend to anyone who is considering purchasing them. I was not all together impressed with this set, my biggest problem with them was I was expecting them to be a little bigger the photos don't do them much justice in the size department. In truth the small one is about the size of a medium letter opener and the larger the size of your average locking blade pocket knife. Don't get me wrong these are really cool looking knifes and have a sturdy look, but I just feel that they made them seem bigger than they were, I think they should have charged more like $5 then almost 10 after tax. If I had bought these for myself I would be considering sending them back, but seeing as they are a gift for my friend who likes a lot of stuff form this site they get a 3 from me. These knives are VERY small, but make a VERY nice addition to any collection. They are also sharp, and look very nice. I like them. i like the design of the blades a lot, beautiful but moderately comfortable to hold but still difficult for my hands to grasp.